As you may or may not have known, I have a crazy sweet tooth. I love all things sweet and I was walking in the grocery aisle at Target and these bad boys caught my eye. IT HAS BEEN YEARS SINCE I HAD THESE PILLSBURY CINNAMON ROLLS. I just had to get it. The pack came with about 8 cinnamon rolls and I used the first 6 to make them. I used the normal icing that came with the packaging and when I finished making them, they looked so sad and boring (no offense cinnamon rolls!) So of course, I had to add some color and life into these cinnamon rolls. These bite sized balls are so cute and so easy to share with friends and family. I’m so excited to make more of these in the near future! 1. Take out the cinnamon rolls from the packaging. Take one cinnamon roll out and rip it in half or into thirds and roll them into a ball. 2. Cook the cinnamon balls for about 10 minutes (or until they are cooked througly) and let them cool off. 3. 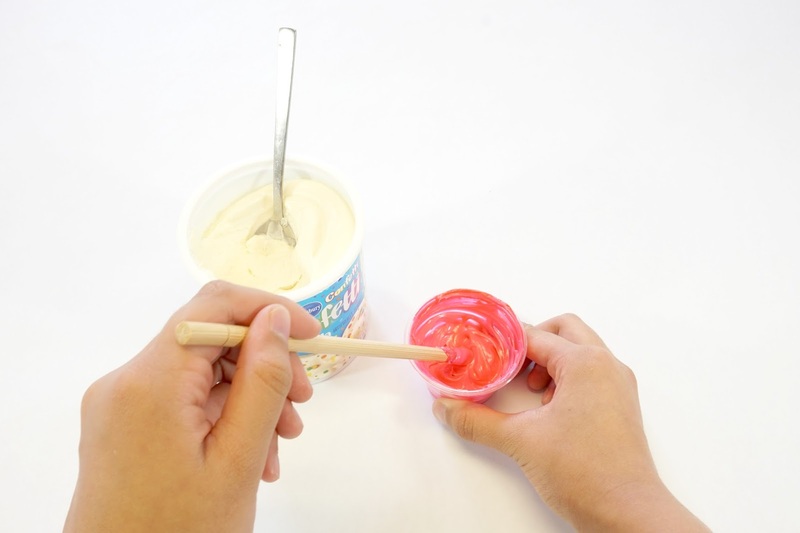 Scoop a spoonful of frosting and put it into a dipping cup. 4. Add a drop of food coloring and mix it within the frosting. 5. Dip your cinnamon balls into the different colored frosting and you will have some super cute and colorful dessert!